Located in Mumbai, we have earned a good name in the global markets for manufacturing, supplying and exporting the Vertical Centrifugal Pump of the best kind. 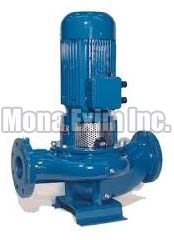 According to required flow and pressure, we furnish the appropriate Vertical Centrifugal Pump at affordable prices. To meet the prescribed standards of the industry, our deft team only utilizes the finest materials and cutting-edge technology in the fabrication of these Pumps.